Scientists at the India Meteorological Department warn that not only has India turned hotter in the last two decades, but that heat waves are projected to become more intense, have longer durations and greater frequency, thereby resulting in more deaths. Sky rocketing temperatures across northern and southern India have resulted in the deaths of more than 1,242 people though officials warn that the death toll would be much higher since a larger number of heat-related deaths in rural India go unreported. Most of these deaths are caused by heatstroke and extreme dehydration. Doctors point out that long exposure to extreme heat raises the body temperature to such a high level that it causes the over-heating of an individual's protein cells adversely impacting the individual's brain. Many of those dead are known to be daily labourers. The searing heat wave in Delhi has seen over 200 dead, the majority of whom were homeless. The worst affected states are Telangana and Andhra Pradesh. The temperatures recorded in Khammam in Telangana was 48 degrees Celsius May 23 while Allahabad city located on the junction of the Ganga and Yamuna rivers saw temperatures reach 47.7 degrees Celsius. Long term data gathered from the IMD's 103 weather stations highlight a dramatic increase in temperatures from 1961 to 2010. If this news was not alarming enough, the last decade between 2001 and 2010 has been found to be the warmest for India and indeed for the rest of the world. Temperatures have risen in the range of 0.8 to 1 degree Celsius with an increase in the number of hot days in India. Nellore, according to IMD statistics, is India's hottest city having recorded 30 very hot days in 1964. This went up to 35 in 1996 and continues to record more than 15 heat wave days where temperatures soar up to 40 degrees Celsius and more in the last 50 years. IMD presently categorises Rajasthan, Haryana, Chhattisgarh, Madhya Pradesh, Vidarbha, Uttar Pradesh, Bihar, Jharkhand, Telangana, coastal Andhra Pradesh and north Tamil Nadu as experiencing heat wave conditions annually which extend for eight days and more. A heat wave condition prevails when the temperature rises to 40 degrees Celsius and more. For hill stations, the heat wave conditions are those where the temperature rises to above 30 degrees Celsius. Temperatures have shot up across most of India's celebrated hill stations including Mussorie, Shimla, Darjeeling, Dalhousie and Chail where temperatures have risen by more than five degrees in the summer months during the last five decades according to government figures. The cities of Mussorie and Shimla recorded temperature around 28 degrees Celsius, but these shot up to 35 and more in 2014. Mussorie recorded a temperature of 38 degrees Celsius last week. Old timers in these hill stations blame the rise in temperatures to unregulated construction activities, traffic pollution and increasing deforestation which has left large swathes of the Himalayan mountain slopes without any covering. Dr D S Pai, a scientist at IMD, warned that severe heat wave conditions are resulting in the death of thousands of people every year. He cites the example of how 1,000 people were killed by a heat wave in Andhra Pradesh in 2002 while another 1,000 people died in the state in 2010. Scientists believe that one of the main reasons for these heat waves is the occurrence of El Nino which occurs in the Pacific coast of South America and adversely affects the Indian monsoon. El Nino results in less rain and corresponding higher temperatures. This view is in line with the findings of the fifth assessment report of the UN Inter-governmental Panel on Climate Change. This latest report has warned that the last three decades have been the warmest since scientists started keeping records since 1850. The reason for these rising temperatures is primarily because carbon dioxide concentrations have increased 40 per cent since pre-industrial times. The result is that both the atmosphere and the oceans are going up. Glacial melting and increasing deforestation is also adversely impact weather cycles. The report states that the total amount of carbon human beings emit should not exceed 800 gigatons, but by 2011, 531 gigatons had already been emitted. The effects of this overdose are for everyone to see -- a relentless heating up of the atmosphere with sea levels increasingly flooding coastal plains. The projections of this IPCC report both mid-term (2045 to 2065) and long-term (2081 to 2100) for South Asia and specifically for India can hardly be considered favourable. 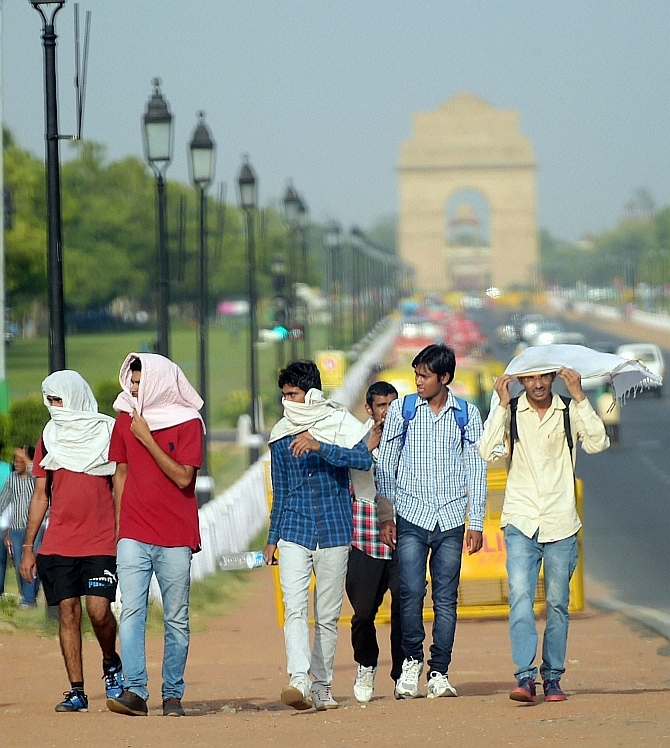 The report has warned that north and west India will face an increase in temperatures while south India will face an increase in tropical nights. Maximum temperatures during the day are expected to increase between 4 and 5 degrees C while the number of tropical nights (the number of 24-hour days above 20 degrees C) are projected to increase from between 0 to 80 days largely in south India. Scientists at the Institute of Tropical Meteorology, Pune, associated closely with the drafting of this report, warn that rising temperatures will adversely impact monsoons. So on one hand, while rainfall is expected to increase by 10 per cent between December to February and up to 50 per cent between September and November, the overall monsoon winds are likely to weaken. Higher rainfall will not mean an extension of rainy days. Rather, it will see an increase in extreme weather events as happened during the torrential rainfall that hit Uttarakhand in June 2013 and the heavy rainfall that caused flooding of the Jhelum river in Jammu and Kashmir in 2014 causing destruction in a large part of the capital city of Srinagar. Apprehensive of the rapid rate of glacial melt, the Nepal-based International Centre for Integrated Mountain Development warned that 54,000 glaciers in the Himalayas could create glacial lakes which would rupture their banks and destroy the surrounding infrastructure and agriculture. The bursting of the glacial lake in Kedarnath precipitated the devastation in Uttarakhand. A similar lake has been created by landslides on the Kali Gandaki river in Myagdi in Nepal following the massive earthquake in Kathmandu last month. If the lake breaches, it would result in disastrous downstream flooding which would extend up to several cities in Bihar. Scientists question how increasing urbanisation will handle future climate problems, especially since cities produce three quarters of greenhouse gas emissions related to household consumption. While Prime Minister Narendra Modi is pushing for smart cities, their environmental consequences of this large scale urbanisation has still to be worked out. The IMD has warned that heat wave conditions will continue for another eight days. The occurrence of another El Nino phenomenon in 2015 does not portend well for the country as heat wave conditions can continue up to September. Dr Harsh Vardhan, India's minister of science and technology, admitted as much when he provided details of the annual monsoon for 2015. A bad monsoon would mean one more year of poor rains and see a decline in food production. More serious is the viewpoint of several scientists who believe that warnings on heat wave conditions should be included as part of the disaster management plans being prepared by the National Disaster Management Authority both at the central and state levels. Stallone wants to cast Salman in Expendables!